When you're pregnant, it may seem as if your brain wants you to eat one thing but your baby wants you to eat another. The hormonal changes during pregnancy sometimes trigger intense food cravings, according to the University of Maryland Medical Center. If images of polish sausage haunt your dreams, you'll be glad to know that it isn't exactly off limits during pregnancy. Eating it in moderation likely won't cause problems, but excessive consumption or improper preparation methods could mean problems for both you and your growing baby. Processed meats can contain listeria, a type of bacteria that can reach your baby and cause infections. These infections may lead to miscarriage, the American Pregnancy Association cautions. Polish sausage may also contain nitrates, a food additive that prevents the growth of certain types of bacteria that cause botulism. Nitrates might cause cancer, and some forms of nitrates can cross the placenta and remain in your baby's tissues even after she's born. Since scientists have yet to establish a clear, direct link between nitrates and fetal complications, Polish sausages are considered safe to eat in moderation. Aside from nitrate exposure, excess consumption might lead to other problems during pregnancy. The sausages typically contain high amounts of sodium, which can make foot and ankle swelling worse. Depending on the recipe or manufacturer, the sausages may also contain high amounts of saturated fat and calories. Consuming too many foods high in saturated fat and calories increases your risk of heart disease and weight gain. Infections caused by listeria and food-borne illnesses associated with other types of bacteria are preventable if you follow proper cooking and food safety guidelines. Food Safety.gov recommends cooking the sausages to 165 degrees Fahrenheit to kill potentially harmful bacteria. If you don't have a food thermometer, make sure the sausages are hot all the way through to the center and steaming before you eat them. Never eat raw, cold or undercooked sausages. 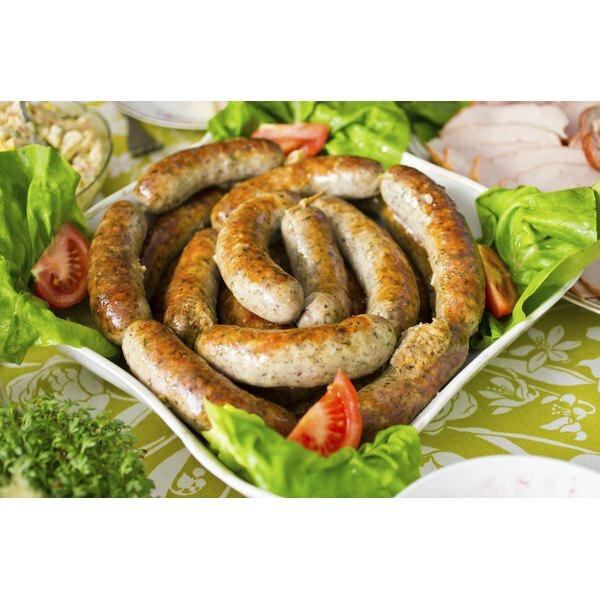 The risk of coming in contact with harmful bacteria doesn't disappear when you cook your sausages thoroughly. Any counter tops, plates, utensils or surfaces the raw sausages or their packaging touched all pose a cross-contamination risk. After you prepare your sausages, throw away the packaging and wash all your cooking surfaces with an anti-bacterial cleaner or bleach solution. Wash your hands before you eat or prepare other food items. The Linus Pauling Institute; Nitrosamines and Cancer; Richard A. Scanlan, Ph.D.